As part of the training, students perform in London theatres to paying audiences. This gives students an opportunity to showcase their work to the industry, whilst putting into practice what they have learnt during the course of their training. Theatre showcases take place every year with a cast of current Kingdom Drama School students who work for 10 weeks on a production under the careful guidance of their tutors. The performance usually brings together a series of scenes from some of the most renowned playwrights, linked together through a common theme. James Reid and Camilla Oakes performing in their end-of-term showcase at the Bow Waterside Theatre, London. 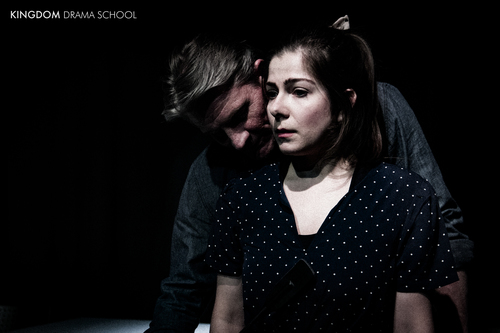 Anthony Rhodes, Susannah Wells and Kara John performing in their end-of-term showcase at the New Diorama Theatre, London.